metaPhorest, a platform for experimentation, research and production in the realm of "life" themed art/aesthetics (bio art, bio media art, biological art, bioaesthetics) in reference to developments in bioscience and the theory of life，was installed in 2007 in a biological laboratory at the Center for Advanced Biomedical Sciences, Waseda University. This exhibition introduces in four consecutive parts the achievements of two artists each that currently or recently stayed and worked at metaPhorest. An open laboratory is planned to be set up during the exhibition period for visitors to observe the artists' production and experimentation. 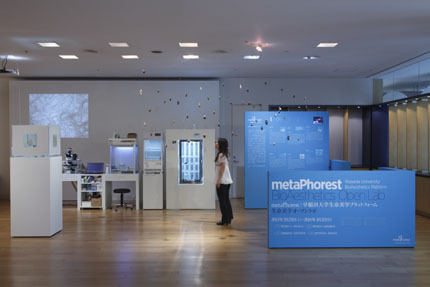 *The title "metaPhorest" carries multiple connotations, such as "metaphor + forest," "meta-forest," and "super-metaphor." "Exploring Life at Open Space"